Do you want a distinctive look for your shower? Are you looking for a quality tile that will hold up to the rigors of daily use without fading, cracking, or causing other problems? Then what you need is the best tile for a shower that combines quality and affordability into one stunning package! Are you ready to see what tile is the best tile for your shower today? There are so many different types of tile on today’s market that it can be a time consuming task to determine which tile is the best tile for your home. To help make this decision a little easier, we’ve put together this helpful chart that puts all of the information you need to have right at your fingertips. Why Is Bathroom Tile So Important? It stands to reason that every surface in your bathroom needs to be water-resistant in some way. Whether it is the caulking along your sinks, the paint used on your walls, or the interior of your shower or tub basin, any failure in this protection against water means you’re providing the perfect atmosphere for mildew or harmful molds to begin growing. That’s why bathroom tile is becoming more of an emphasis in bathrooms today. Those all-in-one shower units that are made with either ceramic or a high grade plastic install along the wall and are sealed using a strong caulking compound. Over time, that caulk will begin to degrade and it only takes on entry point for you to start having problems that can actually degrade the structure of the room and even rot out your floor. With bathroom tile, you gain an immediate advantage because the tile can be installed right on the wall. When grouted properly, you’ll have a water-resistant surface that will keep the integrity of your wall intact over a longer period of time. Tile is very easy to clean as well and dries quickly… and a dry surface is the best surface to have because it prevents viruses and bacteria from finding a home – not to mention mold and mildew! Even if you’ve got hard water, mineral build up that is common, or even lime scale, you can benefit from the installation of bathroom tile. A variety of cleaners can be used on this surface that will make your cleaning chores a snap! From every viewpoint, bathroom tile is a superior product to have installed. That is why it is so important to have. The primary advantage that you’ll receive with the installation of great shower tile is a distinctive look. Tile comes in a variety of sizes, colors, and styles so you can pick out the perfect coordinating look for a stunning bathroom. It’s easy to install as well, where even the average DIY homeowners can have the project completed over the course of a weekend. Besides the advantage of having a surface that is easy to clean and offers more water resistance to the structure of your wall, bathroom tile also holds a better resale value over time than other bathroom fixture installations tend to hold. It lasts longer, protects better, and often looks a lot better and those three features mean you’ll get more resale value out of your home. If you use bathroom tile for the flooring surface of your shower, then you’ll also receive the advantage of having a better non-slip surface. When you’re standing in a bathtub for a shower, even one with non-slip surfaces installed, you’re risking an injury every time you lather up with soap or shower gel because you’re creating a slick barrier between your foot and the surface of the tub. Tile works with your feet and reduces these risks enormously. The final advantage that bathroom tile provides a bathroom is that most tiles are resistant to stains. The bathroom can be a dirty place for obvious reasons. From rust rings on your shaving gel bottles to the grease that gets brought in from changing the oil in your car, there are a lot of ways for your typical shower or tub to get a stain. Tile resists all of these elements. Shower curvature. If you have a curved area where you’re going to be installing your shower tiles, then select smaller tiles. They’ll work a lot better for you because they’ll require less cutting to work with the curves of your installation point. Slip ratings. Most shower tiles are assigned one of three slip ratings: A, B, or C. A tile with an A rating will be much more resistant to slipping than a C rated tile. Think about feeling. How good does the tile feel to you? The best shower tiles will look good and feel good, so don’t just shop with your eyes. Shop with your sense of touch as well. Coordinate types of tile. With more than one kind of tile in your bathroom, you can create stunning, dramatic looks that will still be water-resistant. Tile material. Most bathroom tile is made from either glass or ceramic materials. There are other types of tile out there, however, and so are a lot better than others. Ledgestone, for example, will create a stacked visual aesthetic, but it can be stained by water and it makes drainage slower in the shower. What Are the Prices For the Best Shower Tile? There are a wide variety of pricing structures for shower tiles, so it is important to find what you need first. Are you wanting to install individual tiles? Or do you want to install blocks of tiles that you affix to the wall and then just grout later on instead? A basic block of shower tiles can be as little as $4.95 per square foot. On the other hand, complicated patterns or unusual tile materials can drive the price above $80 per square foot. The average price most homeowners will pay is generally about $20 – $30 per square foot for quality tile. For the average shower, that generally means a full remodeling project can be accomplished for less than $750 and still use quality materials for the process. What Do Our Reviews Have To Say About the Best Shower Tile? For a classic look, this shower tile will provide you with everything that you need. 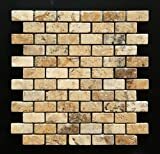 It has random thickness to create a rough surface and each stone is chipped by hand around the border of each tile sheet to create a rugged, natural look. The tile is mounted to a sturdy mesh that makes installation easy, even if you’ve got to cut through the tile for a specific installation point. The only issue you may encounter is that some of the tiles may be darker than others, so you may need to be careful about where you install each set. 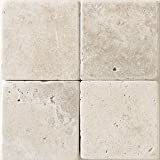 Click here to compare prices and get the best deal on this tile. For a bathroom tile that works as well on the floor as it does along the wall, this 12×12 sheet of meshed tile has the ability to get the job done effectively. It’s called “red,” but the product itself is more of a burnt sienna color, so it works well with Earth tones. It feels nice, has a glossy appearance to it, and looks brilliant when a reddish grout is used to finalize the product. The price is fair and the installation is incredibly easy. If you love the look of marble, but don’t want to invest in the full cost of hand-cut marble for your bathroom, then this shower tile will give you the unique look you want. 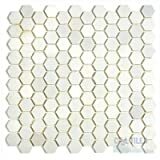 Each tile is cut in a hexagon shape, yet is on a mesh so that installation is really easy. It’s important to realize that each block won’t cover a full square foot, however, so plan accordingly. Grouting can be a bit tricky with the different transfer points, but your efforts will be well rewarded in the end! Sometimes classic beauty and style is the best – that’s why it’s called “classic,” right? You’ll get that with this product, designed in the versatile 4 inch x 4 inch square design. You’ll have to install each tile individually so it’ll take a lot of extra work to get the job done, but the effort will be well worth it. You can purchase this in 50 square foot lots as well and there are enough variations in color that you’ll get a tumbled look that stands out, yet is the perfect installation weight. If you like the idea of an individual tile installation, but want more color contrast than you’ll get from other tumbled tile, then this shower tile is a good choice to make. It’s a low cost alternative that is competitive with mesh tiling options and is very water resistant. Best of all, the tile is strong enough that you can easily cut them without having the difficulties of having them break or crumble on you. Yellows, reds, and browns fill out the space and will let you assemble your own bathroom pattern. It’s a great product at a great price! Are you ready to turn your shower into the one place in your home that will make time truly stand still? Then you’re ready to take this information and select the best shower tile for your home right now!